Windsor is central to the tri-city area formed by Greeley, Loveland and Fort Collins. The city’s central location and easy access to I-25 have lead to rapid, strategic growth in the last decade. With a population of just over 15,000 residents (latest Chamber of Commerce projection), the city has over 116 acres dedicated to parks. Click here to read about the existing parks as well as the new parks currently being built. There are three championship quality golf courses right in Windsor. Pelican Lakes Golf Course, located in the Water Valley development, has the most waterfront greens of any course in the United States. Click here to visit the city website! * Data pulled from 2010 Census unless otherwise indicated. 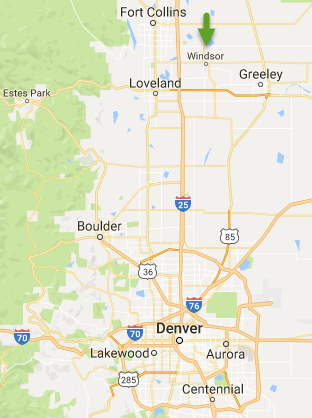 * Nearby Airports: The Loveland-Fort Collins Municipal Airport is jointly owned by the cities of Loveland and Fort Collins. The Denver International Airport is located just 60 miles south of Loveland. Annual Days of Sun: 300 days. Avg. Annual Snowfall: 49.7 in. Avg. Annual Precipitation: 15.0 in.